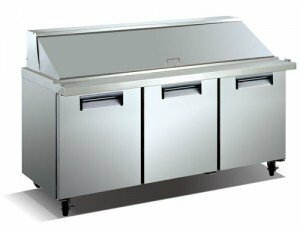 Arctic Air’s food prep units are designed to bring you real, commercial foodservice grade performance at a truly incredible value. All Arctic Air products are tested to NSF Standard 7 levels and must pass numerous quality control inspections throughout manufacturing process. In addition, all products are operated and monitored for a minimum of 13 hours prior to packaging and shipping. 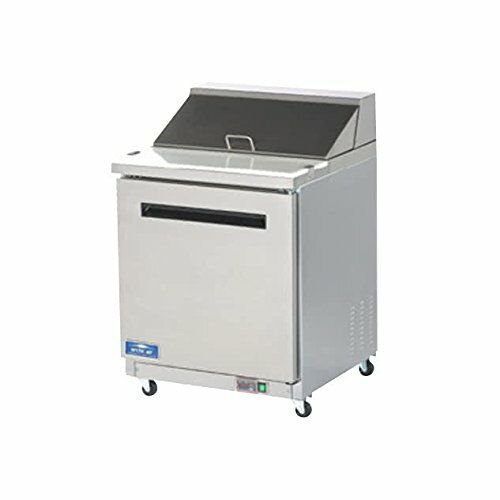 More importantly, our products have many features that are desired in today’s commercial foodservice market. 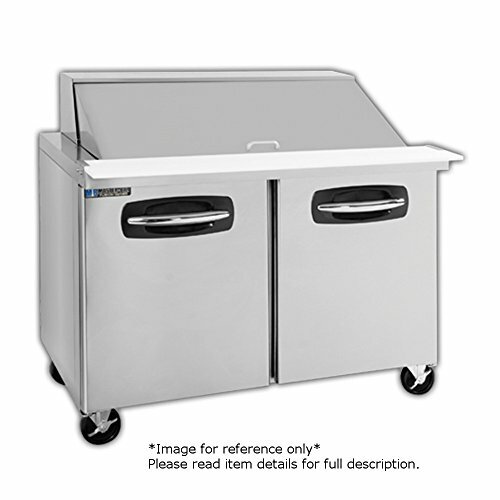 This 3 Door Commercial Pizza/Salad/Sandwich Prep Table comes with high grade 304 stainless steel interior & exterior and (2) Locking, (2) Non-Locking Casters. Power Requirements: 5.7 Amps @ 110-120v AC (Regular 3 prong outlet). Actual Dimensions: 72.7" W x 34" D x 46.6" H. Net Weight: 396 lbs. Shipping weight (we double crate each item) 500 pounds. ETL listed; conforms to NSF Standard 7. 5 YEAR COMPRESSOR WARRANTY INCLUDED. 1 YEAR ALL ADDITIONAL PARTS. Business Addresses that have Dock's are highly recommended for delivery. Standard delivery is curbside delivery. Please read our Amazon storefront info and shipping policies, as it may not be possible for us to ship this item to your location. Model MSF-8308. 3 Doors with 22.5 Cubic Feet! Very high grade 304 stainless steel interior and exterior! Upgraded 30 Pan Mega Top Version! 3 Shelves Lock fitted Digital controller Forced air cooling Adjustable 33-41Â° F Temperature. Adjustable Wire Shelves. Self closing doors. Recessed door handles. 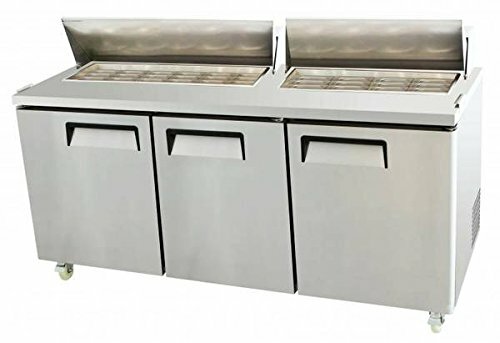 GN pan suitable (Holds 30 pans) not included High grade 304 stainless steel interior & exterior Power Requirements: 5.7 Amps @ 110-120v AC (Regular 3 prong outlet) Actual Dimensions: 72.7" W x 34" D x 46.6" H Net Weight: 396 lbs. Shipping weight (we double crate each item) 500 pounds (2) Locking,(2) Non-Locking Casters 1/2HP Compressor - 5 Year Warranty Included ETL listed; conforms to NSF Standard 7 5 Year compressor warranty included. 1 year all additional parts. 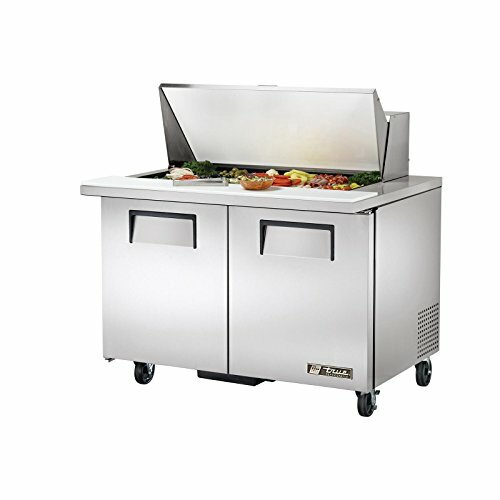 Master-Bilt's FusionTM Mega Top Sandwich/Salad Prep Unit, two section, 48" wide, accommodates (18) 1/6 pans included, door on left, refrigerated drawers on right, insulated lid, 9-1/2" reversible cutting board, 13.4 cubic feet refrigerated base, stainless steel interior & exterior, rear mounted refrigeration, 6" overall ht. casters, 3/8 hp, 115v/60/1-ph, 5.2 amps, NEMA 5-15P, UL, cUL, UL EPH. 3 year parts and labor warranty. 5 year compressor part warranty. 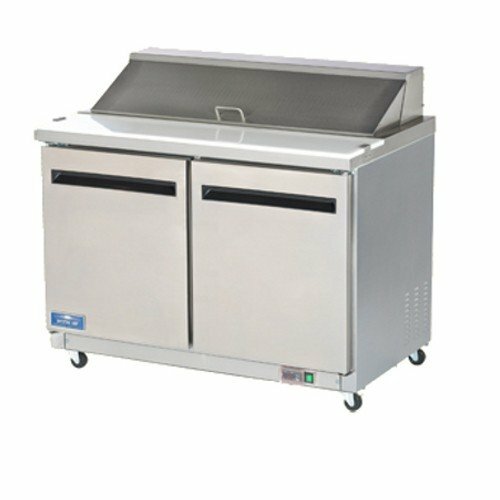 Salad Sandwich Mega Top Commercial Prep Table 60"
BRAND NEW - Salad Sandwich Mega Top Prep Counter! 2 Doors with 13 Cubic Feet! Very high grade 304 stainless steel interior and exterior! - Upgraded 24 Pan Mega Top Version! 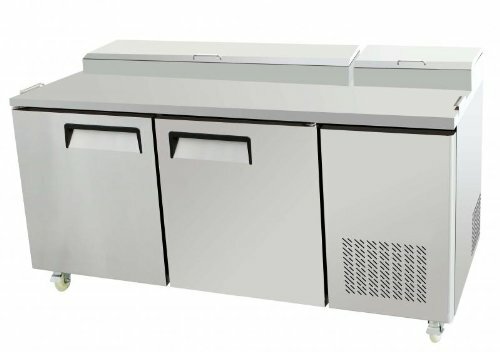 - 2 Shelves Wire - Digital controller - Forced air cooling - Adjustable 32-50° F Temperature - Electro-Mechanical Thermostat - Side Mount Compressor for improved efficiencies - 2 Adjustable Wire Shelves - Ergonomic design - Recessed door handles - GN pan suitable (Holds 24 pans) included - High grade 304 stainless steel interior & exterior - 1/3 HP Compressor - 5 Year Warranty Included - Power Requirements: 7.8 Amps @ 110-120v AC (Regular 3 prong outlet) - Actual Dimensions: 60.5" W x 35.5" D x 46" H - Net Weight: 297 lbs. Shipping weight (we double crate each item) 500 pounds - (2) Locking, (2) Non-Locking Casters - ETL listed; conforms to NSF Standard 7 - 5 YEAR COMPRESSOR WARRANTY INCLUDED. 1 YEAR ALL ADDITIONAL PARTS - Street, Curbside Delivery only - Must have Phone # for Freight Truck Delivery Appointment. USA, CA Customer Service and Parts. Warranty Parts only. SORRY, No Shipping to any Island location off the Mainland, USA, such as the FL Keys. 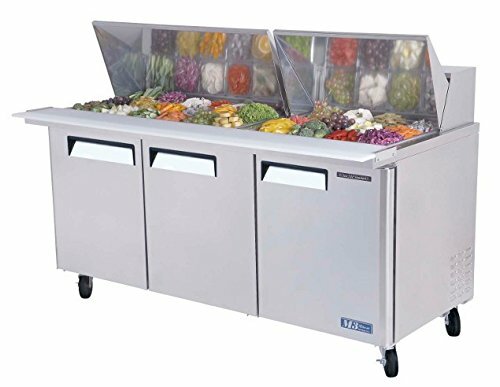 True Food Service Equipment TSSU-48-18M-B Food Prep Table Mega Top Solid Door Sandwich/Salad Unit has 2 Doors with a 12 Cubic Foot Capacity, Oversized CFC-Free Forced-air Refrigeration System Holds 33-41 Degrees F, Exterior is Stainless Steel Front, Top and Ends with Matching Aluminum Back, Interior is NSF Approved White Aluminum Liner with 300 Series Stainless Steel Floor with Coved Corners, Stainless Steel Door with White Aluminum Liner has Positive Seal Self-closing 90 Degree Stay Open Feature, Complies with and Listed Under ANSI/NSF-7-1997-6.3, Patented Stainless Steel Removable Foamed Insulated Lid and Hood, CFC-Free R134A Refrigerant, 11 3/4 inch Deep 1/2 inch Thick Full Length Removable Cutting Board made from High Density NSF White Polyethylene, 4 Heavy Duty PVC Coated Wire Shelves, Foamed in Place High Density CFC-Free Insulation, 5 inch Locking Castors, Epoxy Coated Evaporator, 18 1/6 size Clear Polycarbonate Food Pans, UL NSF CE, 7 Foot Cord, Overall Dimensions 48 5/16 inches W x 34 1/16 inches D x 46 15/32 inches H.
This 2 Door Commercial Pizza/Salad/Sandwich Prep Table Refrigerator comes with high grade 304 stainless steel interior and exterior and (2) Locking, (2) Non-Locking Casters. Power Requirements: 7.6 Amps @ 110-120v AC (Regular 3 prong outlet). Dimensions: 67" W x 33" D x 41" H. Net Weight: 550 lbs. ETL listed; conforms to NSF Standard 7. 5 YEAR COMPRESSOR WARRANTY INCLUDED. 1 Year for everything else, parts only. Business Address's that have Dock's are highly recommended for delivery. Standard delivery is curbside delivery via lift gate. Color: Same as in the picture. 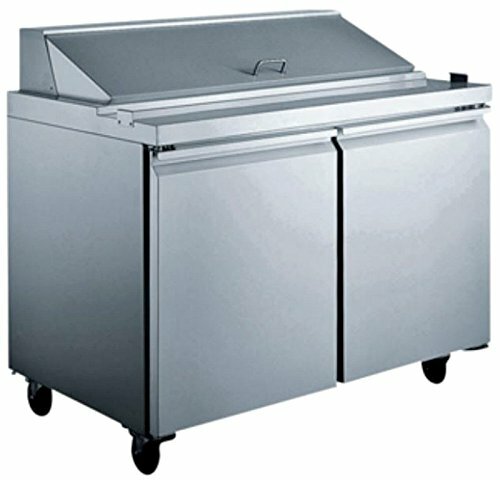 Copyright © Wholesalion.com 2019 - The Best Prices On Refrigerated Mega Top Sandwich Table Online.